Some 64,882 visitors thronged to the Albay Park and Wildlife (APW) in Legazpi City providing at least P2.2 million revenue for the provincial government from the entrance fees of the guests. Dr. Florencio Adonay, Albay provincial veterinarian said the number of visitors and revenue could have been higher if not for the park’s closure to give way for its immediate renovation to accommodate construction of additional facilities. Earlier, Albay Gov. 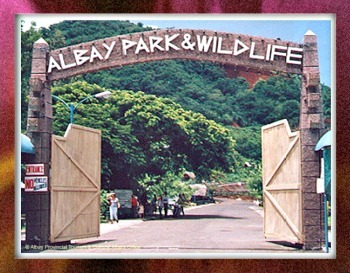 Joey Salceda ordered the renovation of the Albay Park and Wildlife to improve facilities for the use of visitors while at the same time the haven for animals kept inside the park. Adonay furthered that although the facilities were nearing completion, the park is still a top grosser in gate receipts because of its welcoming environs of spacious mini-forest and caged animals numbering about 22 plus the 46 others representing various species. Amusement features consisting of playground, biking area, lagoon for boating, cottages for picnics and meeting, horseback riding area, food court, zipline and a nerve-wracking wall-climbing facilities are also added inside the park. Adonay said the park has been a favorite itinerary for educational tours, family picnics, meetings and social gatherings, adding that the most important role of the facility is to serve not only as an eco-tourism area but also as a wildlife rescue center. “We also cater to research on wild animals as well as everything about flora and fauna,” he added. Located at the foot of Lignon Hill in Legazpi City, the five-hectare facility is expected to re-open by second quarter of this year, maybe in time for the province’s hosting of the Palarong Pambansa in April — a time when Albay expects thousands of visitors. The province of Albay will be stepping up its tourism programs to offer better experience for all local and foreign tourists visiting the province. In his message during the first meeting of the Albay Tourism Council this year, Governor Al Francis Bichara calls on tourism stakeholders to have a united and coordinated front for the betterment of the tourism landscape in the province. Bichara directed council members to work together to further uplift the quality of tourism services provided by stakeholders and to come up with more affordable tour packages. He likewise urged representatives from the Department of Public Works and Highways present in the meeting for improvement of tourism infrastructures to ensure that all tourists are not just comfortable, but also safe in their travels. Also in the said meeting, Albay Tourism Officer Dorothy Fernandez Colle presented the Annual Investment Plan of the Provincial Tourism and Culture Affairs Office along with achievements and programs implemented during the first half of the year. Colle cited the success of the Daragang Magayon Festival which still remains as the top tourist drawer for the province and the successful participation and collaboration with the Department of Tourism and other provinces in the region in the recently concluded Philippine Travel Mart in Manila, the largest and longest running travel exhibit in the country. Albay booth was adjudged as the most visited and was the People’s Choice award first place winner.